One of the ways I have created variation in my gaming has been to mix up story content with other styles of missions. One of these is the Seeker Droid and Macrobinoculars Missions for Galactic Solution Industries (GSI). Often revolving around research, GSI Missions are less about combat and more about exploration and discovery. 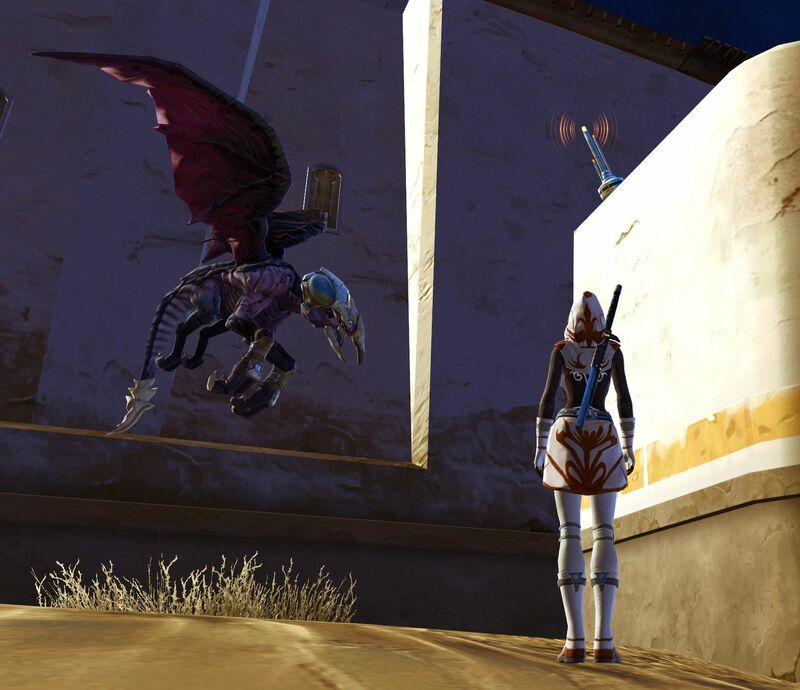 In this blog post, the first in a new mini-series I will cover the overview of the Tatooine GSI Missions in SWTOR. It’s a simple model really: Complete GSI Missions and be awarded a range of reputation points. However, there are bonuses: Complete any Heroic 2+ for a medium amount of reputation. And there is also a weekly GSI Valued Partner Initiative. This requires you to complete 10 GSI Missions for a large amount of Reputation. At level 65, GSI Missions pay really well – around 12,000 Credits for normal missions and 22,000 Credits for the [Heroic 2+]. I’ll double-check my figures on my next run. Let’s zero in on the specific missions for Tatooine. They are all identical for Imperial and Republic characters, apart from the first mission. 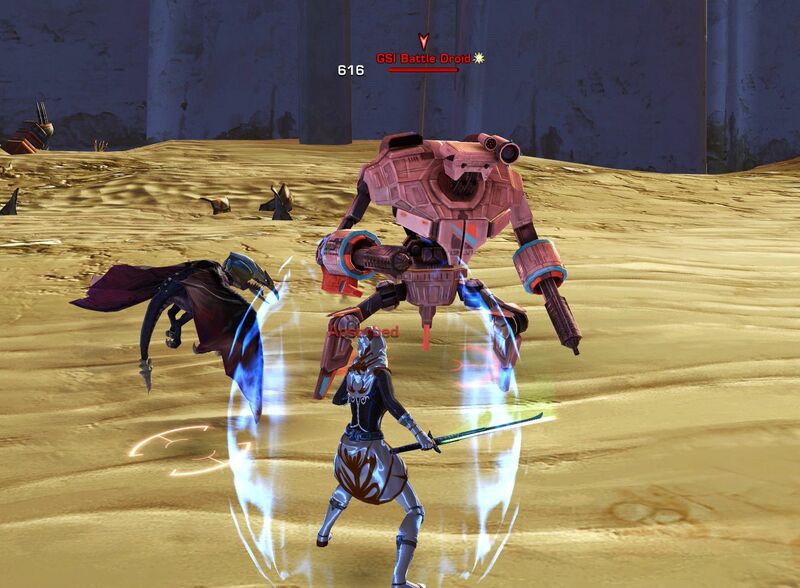 If you’re playing an Imperial character, then A Droid Defiant takes place in Mos Ila. If it’s a Republic character then this mission takes place in Anchorhead. 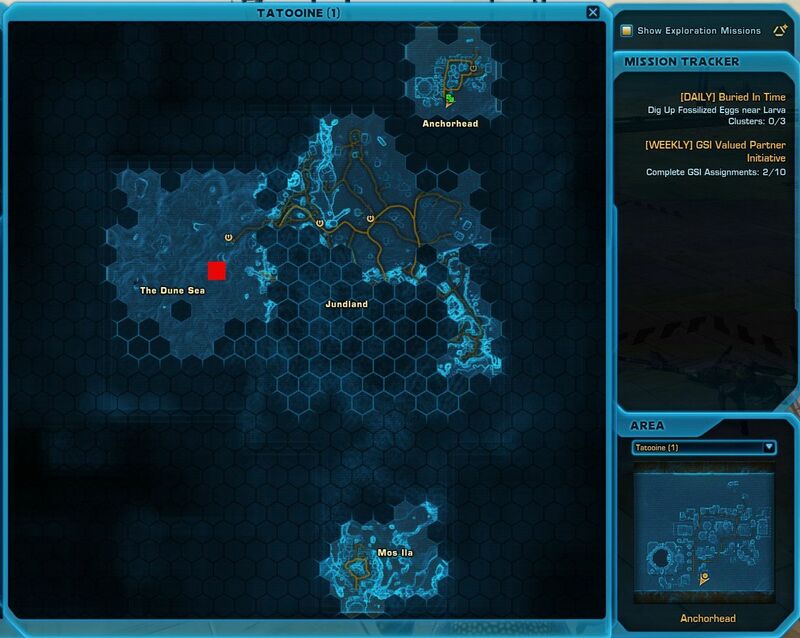 The aim of this GSI Mission is to find and dig up (using your Seeker Droid) – scrambler transmitters around the town. The map markers show approximate areas and do not indicate the actual positions of the transmitters. Your Macrobinoculars will not pick them up, so you need to use your eyes. The spawn locations do change but not radically and with enough repetition you can speed up the process of finding them. Oh and trust me jump on your favourite vehicle or creature and use your eyes. It’s more forgiving than using the Seeker Droid and moving a few paces! Once you have found three transmitters, the rogue droid is triangulated. It’s an Elite Droid, but as it’s H2, you can defeat it with just a companion. 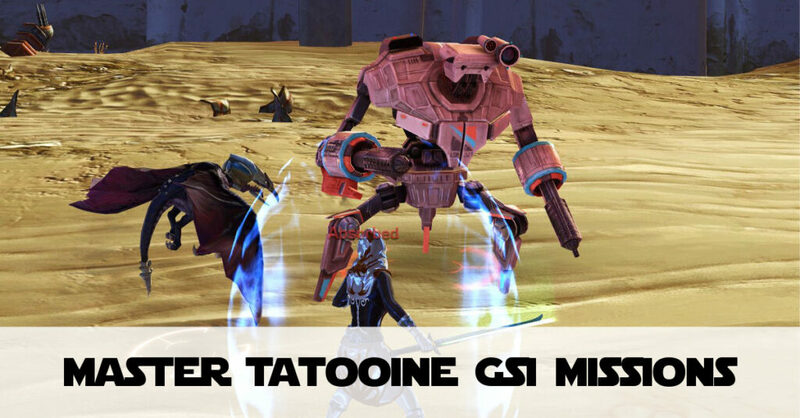 Deliver the results to the GSI Dropbox and you’re well on your way on your Tatooine missions! The next four missions come with clearer maps, so here they all are. Feel free to download them later for reference! Above the Fray sees you trekking across the Desert Dustball looking for Moisture Vaporators, the back bone of farming on Tatooine. If you’re running this as an Imperial, it’s much easier as one of the vaporators is actually above an Imperial outpost (the most Southern marker). Thankfully your Macrobinoculars are really powerful, so you can get close to the Outpost as a Republic player and still see the Vaporator to catch it. 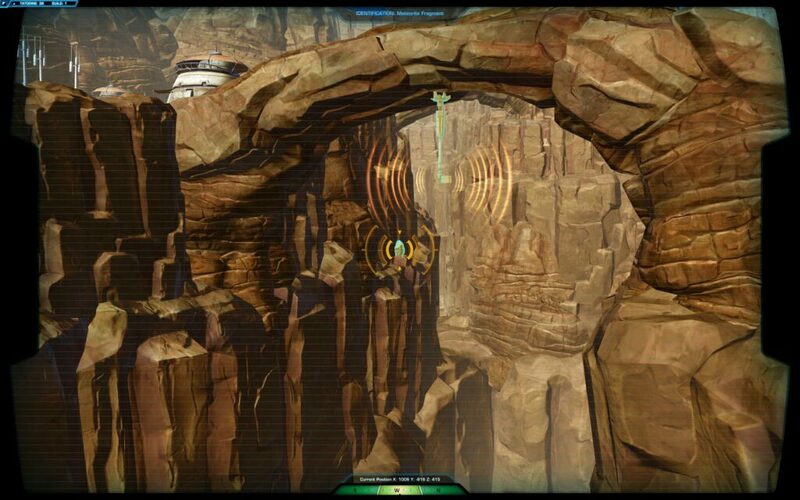 This mission is called Above the Fray because your targets are above eye level, so you’re looking up the cliff faces. To show just how powerful the Macrobinoculars are, here’s an example of reaching one of the Moisture Vaporators. This mission sees you looking down…a lot. You’re looking for Meteorite Fragments in the valleys around The Wound. The map markers are very vague! And you’ll have to fight some Sand People away from the cliff edges to get the angles right. Although you need to look down, the meteorite fragments are not really deep. And you can see them with your eyes – they are a bluey-green hew, which is a stark contrast to the Reddy-Brown tinge of the cliffs. You’ll spend most of this mission traipsing around The Wound. And the exact spawn points of the fragments do change slightly. Once you’ve found a fragment scan it with your Macrobinoculars, breathe a sigh of relief and move on. If you’re also doing The Shroud Story Arc, you can couple finding various items from the Tatooine GSI Missions with locating the Shroud’s Encrypted Transmitters. One of them is right next to a Meteorite Fragment for Scanning the Depths! 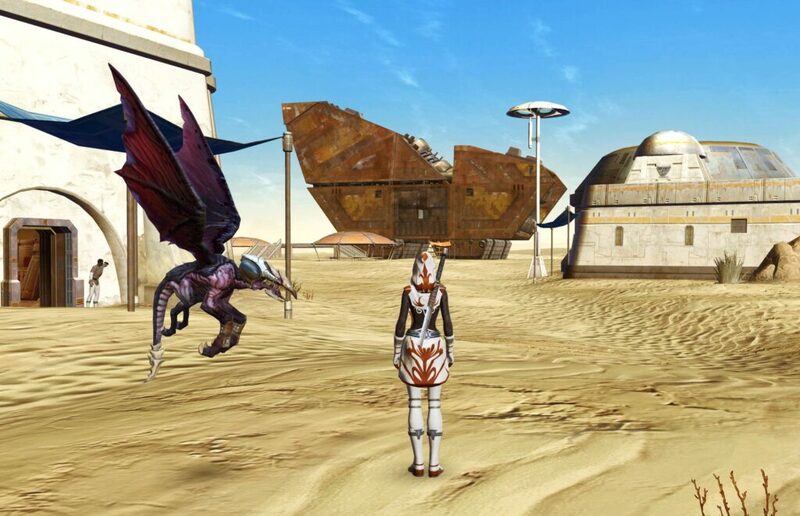 Time to head out to the Krayt Dragon Graveyard for a much simpler GSI Mission. This time you will need your Seeker Droid, but you don’t need it for searching – only digging. You’re looking for small Fossilized Eggs near Larvae Clusters. These are bright yellow and are visible to the naked eye. But they are so small, I can’t decide whether a screenshot would be helpful or not! Each Krayt Dragon skeleton tends to have 2-3 clusters spawning near it. So if you find another player digging these up there are plenty to go around! You’ll know if you have found one by hovering your cursor over the clusters before using your Seeker Droid to dig them up. Once you have excavated 3 batches of fossilized eggs these need returning to the GSI Dropbox in Mos Ila or Anchorhead. But don’t quick travel there unless you’ve completed the last mission! Warning: This is a Random Number Generation Mission. Galactic Solution Industries report some missing droids – probably the thieving Jawas again! You are to scan Jawa Sandcrawlers to find out which one contains the droids. It’s based on random numbers because it may be a different crawler each time. To remind you again, your Macrobinoculars are really powerful, which matters especially in the Dune Sea! As soon as even the smallest tip of a Sandcrawler is visible on your screen, use your Macrobinoculars to scan them. No point wandering all the desert when your technology can do the trick! I’m enjoying the Tatooine GSI Missions, not because of the Reputation, but because of its gameplay style. It’s investigative, not based on your killing prowess. Scanning the Depths can be frustrating, but for a gaming session, they are really relaxing!